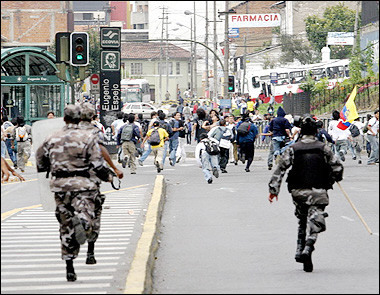 Soldiers Disperse a Crowd of Protesters in Quito. Ecuador’s opposition parties in Congress will try to oust President Lucio Gutierrez for meddling in the country’s courts, congressional leaders said on Monday as thousands protested against the government. “He’s on his own and we need an impeachment to get rid of him,” said Carlos Gonzalez, a congressmen with Democratic Left,one of the main opposition parties. The opposition needs a simple majority to start impeachment proceedings against Gutierrez and a two-thirds majority to oust him. The process could take months and a similar impeachment attempt failed narrowly last year. Candlelight Vigil to Oust President. 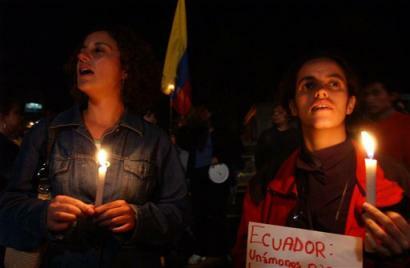 Two Ecuadoran presidents have been overthrown amid popular unrest since 1997. Thousands are protesting in Ecuador’s largest city, Guayaquil. Tens of thousands of protesters followed by a caravan of 300 autos honking their horns stretched along more than 20 blocks of Avenida 9 de Octubre, the major thoroughfare in Guayaquil, a river port on Ecuador’s Pacific coast. The AP is also reporting that that the protests in Quito were smaller on Monday. After five days of mounting street marches demanding Gutierrez’s ouster, protests in Quito were small Monday, consisting of only hundreds of people. However, there was a ‘candlelight vigil to oust the president’ in the evening. In support of President Gutierrez, the Congress backed the move to sack the Supreme Court today in a vote. The Ecuadorean Congress, trying to neutralize the political tumult threatening President Lucio Gutiérrez’s rule, dismissed the interim Supreme Court’s 31 judges in a raucous special session late Sunday night. The dismissal, in a resolution that formalized a presidential order made on Friday under pressure from protesters, was approved 89-0. In effect, it sets the clock back to December, when pro-government lawmakers dissolved the Supreme Court and installed a new one, setting the current crisis into motion.